Finally. So many of my local friends and others online around the world have made this pattern already. Some people have made 2, or 3 or 8! Everyone I know loves it. It holds WAY more than you could ever imagine. It's the Sew Together Bag by Sew Demented. It's one of those patterns that comes along every 6 months or so that EVERYONE falls in love with and wants to make because it's just. so. good. I get a little thrill for the designers of such patterns - how gratifying that their idea inspires so many people to get making! I hit the double whammy with this purchase, because I bought the paper copy at my LQS, supporting an indie designer and a small business owner. I love the convenience of shopping online (and try mostly to support independent business-women like my blog sponsors there, too) but when I can pop into my local and find just what I'm looking for it's a win-win! I'm away on retreat this week and this bag is on my to-make list. Let's see if I get to it. The list is L-O-N-G! 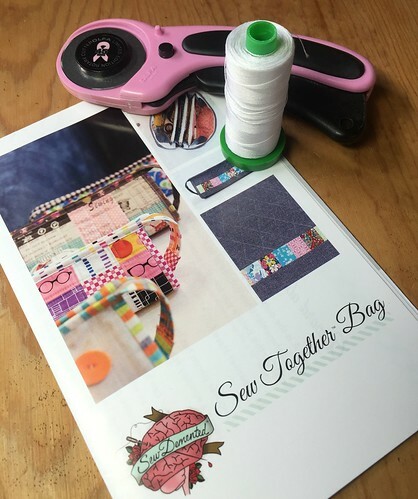 Have fun on the retreat and making your sew together bag! Way to go! Look forward to your version of the Sew Together! I agree with you, too, it is fun to see a design really take off like this one has! Can't wait to see what fabrics you've chosen!